Since countess Gabriella Williams di Strassoldo took over the castle many renovation works were carried out and now the buildings and gardens have acquired their ancient flair again. Among other things, 4 beautiful double rooms in the Rice Mill, which was once a ruined building. The owners offer a "Bed & Breakfast" accommodation. There is also a lovely arched medieval house that may be rented as an equipped holiday house, for a minimum of two nights. To book please use our form. The tower was first mentioned in a document dating back to 565. Both castles developed each one around one of the original towers, which were probably made of wood at the beginning and then of bricks and stones like nowadays. The tower was formally higher and two floors were taken off after a severe earthquake in Lubiana whose effects were felt also in this area. Thanks to recent huge restoration and consolidation works the tower has now acquired its ancient beauty and some frescoes where discovered on its walls. During these works the owners found out that the very thick walls of the tower are hollow in the middle, as many ancient old towers were in medieval times in order to slow down the destructive impact of cannon balls. The tower is really beautiful and furnished with ancient furniture and paintings. On the ground floor there is the family cellar. On the first floor there is the "Radetzky suite" with a big square bed-room, a sitting room, a bathroom with rainforest shower and a cute little terrace facing the garden.On the second floor there is the "Michael Suite", which has a bed-room with a striking brick and wood pavement and open fire-place, a sitting room and a bathroom with Devon&Devon bathtub. The suites are rented for a minimum of two nights. The rice-mill was a total ruin until 2007 and has now been beautifully restored acquiring its previous romantic form. 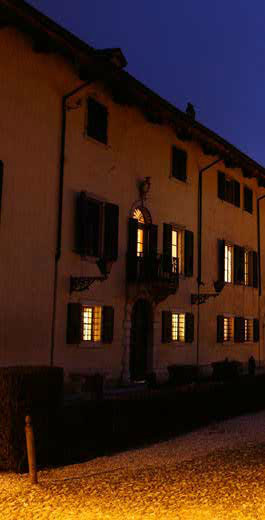 It is set next door to the castle’s main building and has access on the gardens. The wheel still turns and inside there are still the old stones where the rice was peeled. On the first floor there are four very pretty rooms with hand-painted furniture, wooden floors and nice bathrooms with Jacuzzi tubs.The combination of modern but discrete comfort and ancient atmosphere makes a stay in the old mill particularly charming. Our current prices as a downloadable PDF..